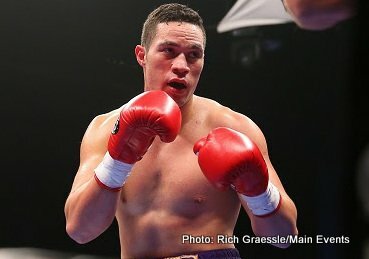 WBA (10) and WBO (11) ranked heavyweight Joseph Parker (12-0-0) is training for his next fight with American heavyweight Jason Pettaway (17-1-0). Parker takes time out of his training schedule to talk to us about his career to date, while also offering his thoughts on joining the Wladimir Klitschko camp later this year as a sparring partner for the man regarded as the best heavyweight on the planet. Joe what’s the plan for you in 2015? Looking forward to getting back in the ring after a good year last year and fighting someone with a different style. What do you think Pettaway will bring on fight night? He’s a mover, not a brawler, not a come at you guy. I had a bit of trouble fighting Nascimento (Marcelo Luiz Nascimento) in Germany last year because I wasn’t used to fighting anyone that moves around the ring as much as he did. I’ll be working with Kev on how to deal with his movement, cutting of the ring, stuff like that. You’ve had two years with your coach (Kevin Barry), how do you see your evolution as a fighter? I see myself as a fighter that’s improving all the time, I put that down to hard work. Kev is big on teaching the fundamentals. Kev said in our first training camp give me two years with you and you’ll see the development, and I have. From your first fight to now? When I compare myself to my first professional fight there’s a big difference, when I look at my first fight I say man is that me! I’m doing the basics a lot better now, sitting on my punches, learning to control and set things up with my jab. How is life in Las Vegas for you? Life is good, I live with Kevin and his family, Kev’s wife Tanya cooks for us and all our team does is eat, sleep and train, everything we’re doing is focused around preparing ourselves to be the best we can. I’m always happy to return back to New Zealand knowing that I’ve prepared well, sparred well, eaten right, my mentality is right. How do you deal with the rigours of training? Sleep (he laughs), it’s a bit of a hard life sometimes, you miss home, you miss your friends, but if you have goals and you want to achieve your goals this is the place to be and these are the sacrifices you have to make if you want to pursue your dream. In your wildest dreams did you see yourself here in Vegas fighting professionally? Very lucky to have been introduced to the right people, Duco (his promoters), Kev and his family, they treat me like one of their own. I like to work hard to repay the faith they have in me. I hear you’ve been sparring Bermane Stiverne here in Vegas? Yeah that’s right, Bermane is a very gifted fighter, big, strong and smart, he makes his punches count, a great experience sparring someone like him, a guy that was heavyweight champion of the world, really good learning experience sparring Bermane. You’re going into Wladimir Klitschko‘s training camp as a sparring partner for his next fight with Bryant Jennings, how does that make you feel? Exciting, a young boy like me, 23 years old, I watched these guys when I was growing up. I met Wladimir Klitschko last year and I was sort of star struck, I said hey Klitschko nice to meet you, thank you for giving me the invitation to come into your camp. Seeing how the champ prepares is going to be a very good experience for me. What mentality do you take into that camp? I won’t be considering myself as just a sparring partner for the champ, for me I feel I have the potential to keep getting better and being able to mix it with the top guys, so going into his training camp my mentality is to give the champ the best I have, and show him I’m not just a sparring partner, that I do have good skills, good technique and I want to be able to provide good quality work for the Champ. What have you heard about being in camp with the champ? I heard that Wladimir challenges and goes hard on his sparring partner‘s but I’m going to be prepared the best I can be and in good shape when I am there, so that I can help Wlad prepare for his next challenge and in doing so help myself improve my skill set in working with the best heavyweight in boxing. Joe there is a lot of talk on boxing forums, articles by journalists framing you and Anthony Joshua as the future of the heavyweight division. Your thoughts on that? Yeah, there’s all this hype around me and Anthony Joshua, but there’s other guys out there, Andy (Andy Ruiz), he’s a really good fighter. Me and Anthony we’re developing, at the early stages of trying to build our careers up and while everyone’s trying to hype it up we are both building our own paths, but somewhere down the track if our careers cross I’d love to fight him. We both need to continue developing and continue winning. After each fight who is the first person you look for? My dad, he loves the sport and as a young kid he’d help me with my training, every time I’m in the ring I’m fighting for me and him. Every time I finish a fight I’m looking for my dad in the crowd so we can celebrate together. The dream fight for you? Kevin Barry (tongue in cheek). I’ll fight anyone my promoters (Duco) and trainer Kevin Barry put in front of me. A message for boxing fans? I am really thankful for the love and support messages that everyone sends me. Sometimes when you’re in camp and you’re feeling a bit tired and you get the messages of support it gives me that drive and inspiration to just keep pushing on. It makes me work harder to be the very best I can be.